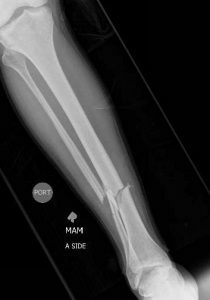 This x-ray shows a displaced tibia and fibula fracture requiring surgical stabilization. Louisville sophomore Kevin Ware’s tibia snapped after he landed awkwardly in Saturday’s Midwest Regional final. Ware’s teammates and coaches watched in horror as his bone protruded through the skin. Millions around the world saw the grotesque injury on television. While Louisville finished that game and defeated Duke to advance to the Final Four, Ware was taken to Methodist Hospital in Indianapolis. Surgeons operated on him for over two hours to stabilize the fracture. Ware woke up from surgery to see the Midwest Region trophy at his bedside. He will travel with his team this weekend as they try to win the school’s third national championship trophy. That flight to Atlanta should take about an hour. His road back to basketball, on the other hand, will be much longer. Surgical treatment for an open tibia fracture, even one as revolting as Ware’s appeared to be, is surprisingly simple. These fractures are actually very common in high-velocity trauma, such as motor vehicle accidents. Surgeons wash out the bones and open wounds. They place a metal rod down the center of the bone to properly align it and allow weight bearing while it heals. Despite the tibia sticking out of his skin, the open nature of the injury should have little effect on his recovery. Infection is certainly possible but not likely. 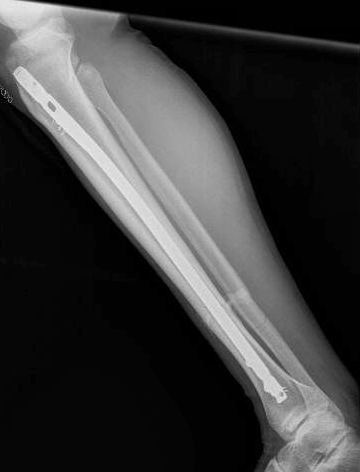 A lateral view of the leg shows a rod placed down the center of the bone to treat the displaced tibia fracture. Supporters are anxious to see Ware return to basketball. Pitino cautions that it could take him one year. Despite many analysts suggesting that the guard could return in as little as eight to twelve weeks, Pitino’s assessment is much closer to what likely will happen. The rod stabilizing the tibia will support his body weight, but the bone has to heal around it. That bone formation usually requires a minimum of three to four months. The bone healing is only the first part of the recovery process. Athletes lose much of the muscle mass and strength of their injured leg. Long sessions of physical therapy to regain strength, knee and ankle motion, and functional ability continue for six months or more. Worse, patients treated surgically for tibial fractures often experience pain in the front of their knees from the insertion sites of the rods. While that discomfort might not bother regular people with sedentary jobs or who perform simple exercise, it can definitely affect athletes who stress that part of their knees by jumping over and over. And Ware will try to return to a level of jumping and running necessary for elite basketball. Whether or not they are rooting for Louisville, millions will be pulling for Kevin Ware. Hopefully one day he will rejoin his Cardinals teammates on the basketball court. Note: The following post appears as my sports medicine column in the April 6, 2013 issue of The Post and Courier. Will the NBA see a surge in injuries too?